Steel producers face continuing challenges to improve EBITDAs which is only possible by pushing the productivity, flexibility and innovation envelope continuously. One such opportunity to transform operations and alter the cost structure is by extracting meaningful signals from the data that is generated in steel plants from commerce to operations. Data signatures, when analyzed holistically in conjunction with domain and process knowledge, can yield superior insights into operations. Digitization across the steel lifecycle thus creates the opportunities for durable competitive advantage by changing the rules of the game. Digital enablement of operations will ensure sustained and superior profitability through improved efficiency and productivity. 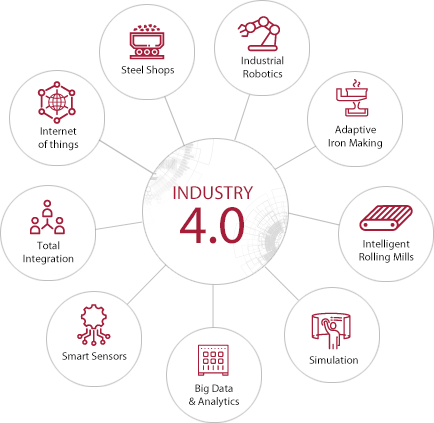 Machine Learning and AI provide the steel industry with the unique opportunity to enable pervasive digitalization. Dastur with its immense knowledge of the domain and data science helps customers embrace digital enablement and transformation early and helps them establish a leadership position in the industry. Steel Melt shop calls for dynamic activities in terms of operation and secondary metallurgy. Data analytics using historical and real-time operational data empowers the operations team with flexibility to adhere to quality and product specifications. Penetration of Robotics in steel is not as vivid as in other industries. The focus in steel industry is to get away with operators from hot metal, noxious gases, heat, sparks, high current systems and other human perils. Emphasis is given on smart sensors and system integration to enable robots to do more things autonomously. Use of data analytics using historical and real-time operational data empowers the operations team to adapt to customer requirements in terms of quality and product specifications. Automatic detection & classification of process deviations/defects and subsequent generation of compensation measures in real-time through feedback & feed-forward control with the basic aim of reduction of manual intervention. Real world problems are characterized by large-scale interdependent parameters as well as variability and uncertainties. This leads to complexity in decision making for both strategic and operational problems. DBTC’s dynamic simulation technologies and competencies, models these problems with accurate depiction of reality and corresponding solutions. They are as diverse and range from vehicle movements, scheduling, capital investment decisions, capacity analysis, plant layouts, and risk models to service center designs. Big data storage will address the complex value chain, recognize patterns by monitoring the risk constantly based on the past data, analyze plant operations continuously through thermal imaging & high-speed videos, analyze the data stream for complex event processing. Smart sensors are the enablers for new automation function and improved performance. They help in improved tracking, data availability for the process models and data analytics. Four basic operating principles of the smart sensors are to measure, identify, communicate & track. This leads to better maintenance efficiency, condition monitoring, downtime reduction of machines. Improved integration of systems & information for optimizing the total investment in terms of value chain, production, performance & services. Digitalization of production process that goes beyond conventional industrial automation. Power of IOT is on the cloud where equipment from different OEMs are virtually connected and can be monitored remotely.The user has to pay based on actual usage of data.